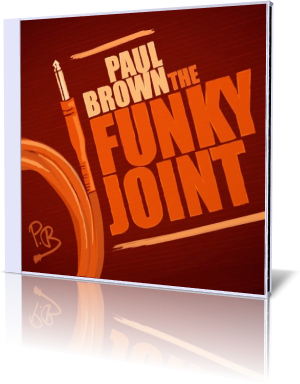 Prolific smooth jazz composer, guitarist and music producer, Paul Brown, has brought the “funky” back into his music with his newly released album, The Funky Joint, a debut on Woodward Avenue Records. A double Grammy® winner, Brown and his Gibson L-5 journeyed back to R&B basics to deliver a double entendre of that funky feeling and a real place, The Funky Joint. “I want my music to make you feel, move and groove, with deep pocketed rhythms your body can easily feel a part of,” smiled Brown during an interview about the March 6 release. His dreamlike, funky musical intent translates into uplifting reality, with tracks destined to make the hips sway, the toes tap, and the eyes softly half-close. 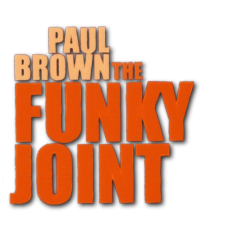 On the funky flipside, the album was recorded at Brown’s personal studio, referred to for years as… you guessed it, The Funky Joint. Two other friends really stepped up to bring their tracks to life, according to Brown. Jonathan Fritzen’s piano chimed in on Tuff Times and the inspired sax of buddy, Darren Rahn on Ya Dig were indispensable to polish the right vibe. Tuff Time plays a heartfelt homage to “the tough times we’re living in,” said Brown. “It’s a brutal time, especially for musicians. They’re feeling the difficulties of staying in business in this economic climate.” You can almost feel the weight of the world in the downtrodden shuffle and Fritzen’s soulful keyboard call and response with Brown. Meant to transport the mind and soul to the European epicenter of Jazz Festivals, Montreux, held every summer in Switzerland, this namesake track has already received solid thumbs up from devotees. Envision Lake Geneva waterfront with your favorite beverage in opulent surroundings, with the slightest hint of a sultry Brazilian passerby. An hour or two immersed in The Funky Joint, is like visiting Brown for a comfortable conversation among friends. You can’t help but leave in a better mood than when you started. For music lovers, though, there’s nothing like live music, especially Smooth Jazz. If you missed, Brown’s CD release performance at Spaghettini’s in Seal Beach, CA, last week, you missed a Paul Brown love fest as well as feast for the ears, with all those clapping hands affirming that the Master’s done it again. Catch Paul Brown performing in California over the next few months, before he grabs his Gibson and heads across the pond to Spain Italy and France for a Fall European tour. Some of the concert venues are at wineries, for twice the fun!